I know it’s been a while, but I promise to try and stay regular! I had my first job interview this week at WRGC radio station in Sylva, NC. I’m excited, because it really looks like they need my skills and all the help they can get. It’ll be good to get back on the air. I guess its strange to some people, but being on the radio in the studio, just you and the mic and the music is a very freeing experience. You can’t help but be who you are, and the listeners eat it up! The best radio personalities are true to themselves, and that is the beauty of radio. At one point, I’d forgotten why I went into radio in the first place. That interview, not even getting in the studio myself, just seeing it, reminded me of the freedom of the air waves. I’m beginning to think that maybe I was born for radio. I’ve been listening my whole life, and creating part of it for about half my life. Feels so strange to say that. At the same time, I’m working my applications to graduate school. I plan on pursuing a degree of MA in Creative Writing. I’m currently in the middle of a massive edit/expansion to a piece I originally wrote four years ago: The Black Castle. My dream school for this is UNC-Charlotte so wish me luck! 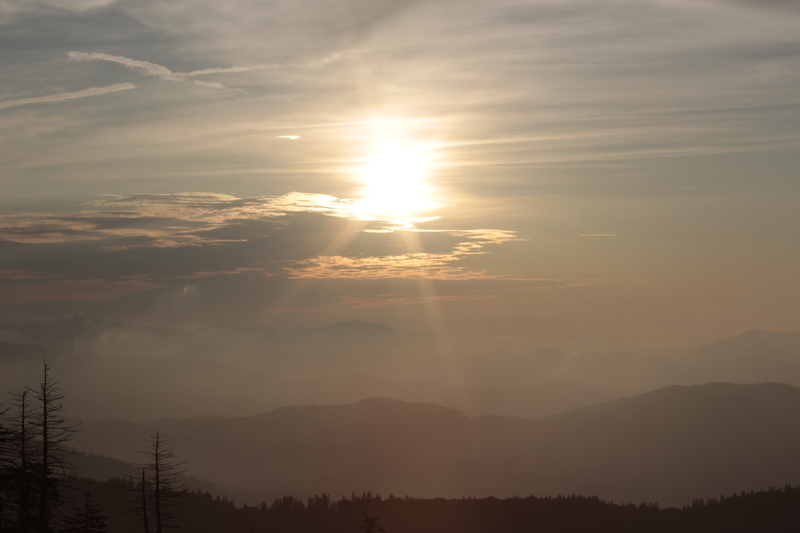 This piece is exclusively mine, taken the morning of July 19, 2012 at Clingman’s Dome in Tennessee.